Hullo. My name is Eleanor Walker, but my mom and dad and most people call me Ellie. I’m seven years old, but I’ll be eight soon. I’m in second grade. Most kids my age think I’m kind of weird. I’m smarter than they are, but my mom tells me that it’s not nice to tell people that. But there’s something else, too, that my mom doesn’t know about yet: I see things that other people don’t see. People, mostly. I don’t talk about that much either, because kids would really laugh at me then. As long as I can remember I’ve seen those people. I figured out pretty fast that most other people don’t, but I don’t know why they can’t. I don’t do anything special, but sometimes they’re just there. They can be anywhere—near my house, in town, or in this cemetery not far from where I live. I can walk there, but I don’t tell my mom. She’d just worry. But I’ve known the way for a long time. There’s this other lady who works for my mom. Her name is Abby, and she has a friend called Ned, who knows my mom too. I’m pretty sure she sees what I see, sometimes. She’s nice, and she listens to me. She doesn’t have children of her own, not yet, but she doesn’t treat me like I’m just a dumb kid. I’d like to talk to her more. Maybe she can help me explain this thing to my mom. I mean, I don’t know how to do it, but I’m pretty sure it’s kind of important. Or maybe I mean, Mom might think it’s important, but not in a good way. I don’t think I’m crazy, but I don’t really know what crazy feels like. It just feels like normal to me. But I don’t like to keep secrets from my mom and dad. Mom says I have to be honest with them, no matter what, and I want to be. But it’s not easy when I see things they don’t see. 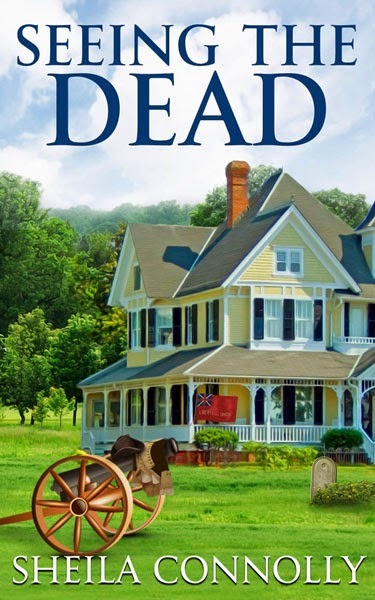 Seeing the Dead is the second in the series that began with Relatively Dead last year. It is available in most e-formats. This sounds like a great series. What a quandary for a 7 yr old girl to know she possesses a special ability but unable to share with parents because they wouldn't understand. In some ways, she's already wise beyond her years. Ellie, would you feel comfortable waiting until you understand better what's going on before you try to explain it? Different from Connolly's other series. I like this series very much. Poor little girl. Sounds like an interesting series. Another one for the TBR.